WHICH INDUSTRIES DON'T USE RAG-ON-A-ROLL? It is difficult, if not impossible, to find an industry worldwide that does not use RAG-ON-A-ROLL WIPERS, often abbreviated simply to "ROAR". Why? Because through smart design of combining 4-plys of absorbent wood pulp tissue with nylon mesh, and affordable manufacturing, these strong paper tissue wipers can handle just about any wipe, spill or cleaning requirement providing a popular cost-effective disposable wiping solution. TIDDOX's unique perforated RAG-ON-A-ROLL product is made in the USA and has made its presence known in multiple industries in Australia as the most affordable and durable scrim paper towels on the market. TIDDOX's "ROAR" is an industrial strength general purpose wiper that is used in many industries, from use as a HOSPITALITY WIPER to an INDUSTRIAL WIPER. 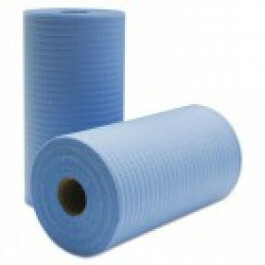 These perforated paper towel rolls are made from absorbent 4-ply wood pulp tissue layered over strong nylon webbing. This produces a versatile disposable wipe with extraordinary strength that can undertake a variety of challenges from scrubbing machinery to absorbing fluids with ease. A tough, durable industrial towel, it is a favourite as a HEALTHCARE WIPE, a MEDICAL CLEANING TOWEL or as a hygienic wiper in a hospital or nursing home. RAG ON THE ROLL has super absorbency to handle large volumes of liquids, helping workers contain spills and leaks efficiently. These scrim reinforced paper rolls absorb oil and grease as easily as they absorb urine or blood. This absorbency means it soaks up viscous and non-viscous fluids with ease, making it an excellent AUTOMOTIVE WIPER and CAR CARE WIPER providing strength for detailing while absorbing water or buffing wax. The nylon webbing is sturdy enough to be used as a PAINT WIPER or for scrubbing painting equipment. It can also be used as a PRINTER'S WIPER to absorb ink and grease and clean printing equipment. Since this is a disposable wiper, laundering is a non-issue. Soft enough to be used to clean hands, it is strong enough to clean machinery. "ROAR" comes on a perforated roll and is available in blue or white. Whether you work in the automotive industry or uin the medical healthcare industry, you need super-absorbent wipes. Viscosity is no problem for RAG ON THE ROLL, because these scrim paper towels offer layers of absorption. As an automotive wipe, they will stop any fluid from running across the floor of your shop. Oil, antifreeze, transmission fluid, all will soak into this automotive wipe quickly. Use them to clean off motor parts and wipe up spills. As a hospitality wiper, it’s easy to drop a couple of these blue or white paper wipers on a spill and keep working. They are as effective at soaking up spilled tea and wine as they are with oil and antifreeze. Even the healthcare industry has discovered RAG-ON-A-ROLL. This superior, multi-layer healthcare wipe is soft enough to use on patient’s skin but strong enough to used for the heavy duty cleaning necessary in the emergency room. You know the frustration of wiping up a mess, only to have the paper tear. This makes an even bigger mess and slows you down. Nobody has time for that! "ROAR" surface cleaning cloths work equally well when used as solvent resistant wipers and microfiber cloths. Four wood fibre tissues are layered with nylon mesh to make a flexible yet resilient wipe. The perforated scrim roll makes it easy to tear off a single towel, but the towel itself won’t tear under regular use. And by regular, we mean tough, scrubbing, wiping-down-machinery-type use. When a "ROAR" wipe gets wet, it stays strong. This is the best combination of strength and absorbency in paper wipers. Emergency service workers use RAG-ON-A-ROLL because it is so quick to put into action. Just tear it off of the roll and drop it on a spill. Mechanics and automotive detailers have learned the value of being able to wipe up a spill with little time or effort. This keeps the liquid from being tracked around the shop or into vehicles. And, with the strength of these scrim paper rolls, you don’t have to worry about the wipes tearing and smearing an even bigger mess. When it comes to shining and polishing RAG ON A ROLL scrim paper wipes are a leading choice. These low lint towels allow the hospitality industry to polish drinking glasses and manufacturers to clean and shine fine-tolerance tools. Regardless of your industry, you need an affordable, disposable wipe. TIDDOX's "RAG-ON-A-ROLL" is the best choice for strength and absorbency. Other related products from TIDDOX 's range of cleaning cloths include the WHITE RHINO WIPES-ON-A-ROLL , the JUMBO RHINO ROLL, and the CLASSIC 300M JUMBO ROLL.